Breakdown of REVENGE of the Smart Page-Turner! The newest addition to Grub’s ground-breaking series of classes that combine the best of literary fiction with the punch of popular and genre storytelling. In this course, students will get serious “hands on” instruction that applies the characteristics of three archetypal figures from pop fiction–the Detective, the Outsider, and the Thief–to the actual process of writing fiction. The goal for students is to acquire a practical set of writing tools that can make scenes and narratives dynamic, emotionally involving and intelligent. Special attention will be given to strategies that can rework familiar pop fiction tropes so they can be used in fresh and innovative ways, which will entail a multi-week analysis of Suzanne Collins’ YA bestseller The Hunger Games. There will also be analysis of how the techniques of great screenwriters like Paul Haggis (Million Dollar Baby), Joseph Stefano (Psycho) and David Mamet can be applied to the “nuts and bolts” of writing popular fiction, be it romance, supernatural, adventure, thriller, crime fiction, science-fiction, erotica, etc. Individual class time will be devoted to the workshopping of portions of novels and/or short fiction. While this class expands upon topics covered in Grub’s “Writing the Smart-Page Turner” and “The Smart Page-Turner Strikes Back!” classes, it is open to all but recommended for those with previous workshop experience. Students should come ready and eager to read a variety of materials across a broad spectrum of taste, from Pulitzer-winning fiction to meat-and-potatoes paperback potboilers. Students should expect to be workshopped 1-2 times over the course of ten weeks, depending on the class size. Please note that this is not a finalized list of readings and other materials selected for the course. Ever notice that really good writers… well… notice a lot of things? The layout of a room? Clothing? Character quirks? Things that just ring true? Noticing things like these is a developed skill. We’ll start this course with a close look at how to look at things in ways that strengthen your writing. 2. Positioning Yourself for the Right P.O.V. Great! We’ve learned how to notice! But is noticing really observing? Contextualizing what you’ve observed is an important writing skill, too. We’ll look at ways to choose the right narrative “vantage point” that will make your writing richer and more resonant. In particular, we’ll look at the ways in which the use of outsiders and thieves as characters in the works we’ll cover gives the authors of those works unique opportunities to dig into human nature. Legend has it Steinbeck once said, “I’m not a good writer. I’m a good re-writer.” We’ll find ways to add/or subtract the right elements from a work by looking at the different tools that screenwriters and prose writers use to tell the same story. A re-write is basically an adaptation of a first draft, almost in the same way a screenplay can be an adaptation of a prose work and a novelization can be a prose adaptation of a screenplay. One of the most common problems with new writers is the so-called “White Room Syndrome”, a failure of imagination on the part of the writer that makes it seem as if the characters are functioning in a vacuum. 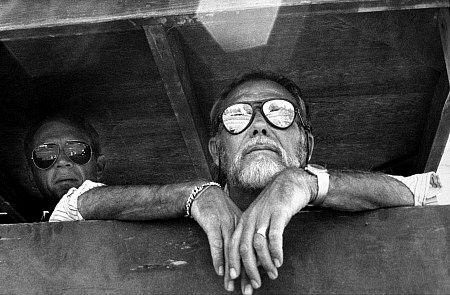 We’ll take another look at the readings and other materials we’ve gone over so far to pick out the ways that these writers and screenwriters have enriched their settings and characters through the use of specific and carefully chosen details. How do you create sub-plots that work with your main plot, and don’t feel tacked on? How do you resolve your main plot, without leaving your sub-plot dangling? We’ll look at ways to weave your plots and sub-plots together so that that they feel like a unified, integrated whole. In particular, we’ll look at the ways that Oscar winner Paul Haggis could take individual stories by F.X. Toole, each with their own plots and story arcs, and weave them together into one great narrative, his screenplay for Million Dollar Baby. There are, after all, only seven plots. How do you tell your story and make it stand on its own? We’ll look in detail at a great recent Smart Page-Turner, Suzanne Collins’ The Hunger Games and dissect its component parts so we can see the actual mechanics of how to pinch ideas and reconfigure them in kinda awesome ways. We’ll continue what we started last week, with particular emphasis on using some of the skills we’ve covered in the class so far to craft our own unique takes on the Seven Universal Plots. We all love detective stories, but what does a detective do? A detective connects disparate elements to piece together a description of what has happened. Isn’t that also what a writer does? We’ll look at a great work of detective fiction for ways to piece together killer plots, anecdotes, scenes and character sketches. So… you’ve got a third-person narrator for your work. How do you give that third-person narrator a voice with a real personality that’s suited to your narrative? We’ll find ways to do just that, plundering tricks that have worked for writers from ancient Greece all the way to the production offices of Mad Men. Ever read a scene that just sits there, on the page? We’ll find ways to use tension and urgency to hook battery clamps to a dead scene to make the little bugger dance. Thomas Harris, Hannibal; David Mamet’s first-draft screenplay for the film version of Hannibal; Aaron Sorkin, “Pilot Episode” teleplay for The West Wing. To enroll, see the listing at Grub Street here. Thanks so much! Post below if you have any questions. I just found out that Janet Berliner-Gluckman died early this morning, October 24, 2012. If I factor in differences of time zones and what I know about the approximate time of her death, I am nearly certain at the very moment of her last breath, I was doing what she taught me to do: revising a manuscript. If, as she left this earth, she saw me at that moment among all the people whose lives she’d touched, I hope the sight of me doing what she guided through multiple times touched a smile upon her. It is no exaggeration for me to say that I would not have a career as a fiction writer were it not for Janet Berliner-Gluckman. She was the first professional editor to solicit and to accept anything I’d written for professional rates. The story in question, “Winter Requiem”, was written as a work of mourning begun while my best friend was dying of AIDS. There were a number of issues with the work, and while there was pressure to remove the work from the anthology in which it was eventually published, Janet steadfastly stood up for my inclusion in the anthology and guided me through a series of rewrites that quite frankly I can’t remember the exact number of. 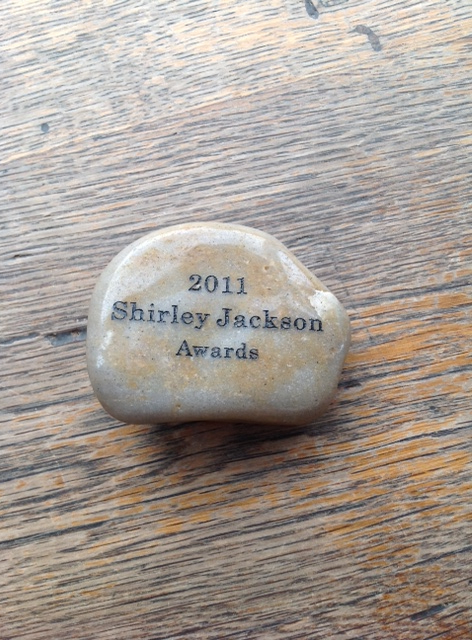 She was a remarkable mentor, and what she has taught me about revision I have in turn passed on to people whose work I have edited at ChiZine and I have also in turn passed on what she taught me to my students at Grub Street. Most of my fiction is about mourning in one way or another. I wrote “Winter Requiem” consciously as an act of mourning. It’s probably right that the work must now retroactively become a work of mourning for Janet. In this light, I hope she takes this as the Kaddish it is meant to be. Another interview this week! Today’s is with Brian James Freeman of Cemetery Dance. Please check it out! Hey, Everyone! 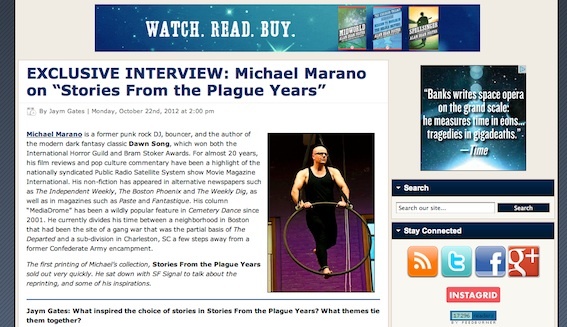 Please check out Jaym Gates‘s interview with me at SFSignal about the upcoming reprint from ChiZine Publications of my collection STORIES FROM THE PLAGUE YEARS. Chizine’s Brett Savory weighs in on the reprint, and you can preview some of the gorgeous interior illustrations by Gabrielle Faust, as well as the bitchin’ new cover by Erik Mohr. Please check it out and RT, if you get the chance! Thanks! Click here to read! Doctor Johansson packed his pipe with another bowlful of tobacco as fictional as the dreams I’d used as weapons. —Would you describe yourself a serial killer if it would help your defense? To cop an insanity plea? No, I am an avatar. —I wouldn’t. Besides, I’m not going to see the inside of a courthouse. I’ll see the inside of a cheap coffin, first. I’d like to make a special announcement. 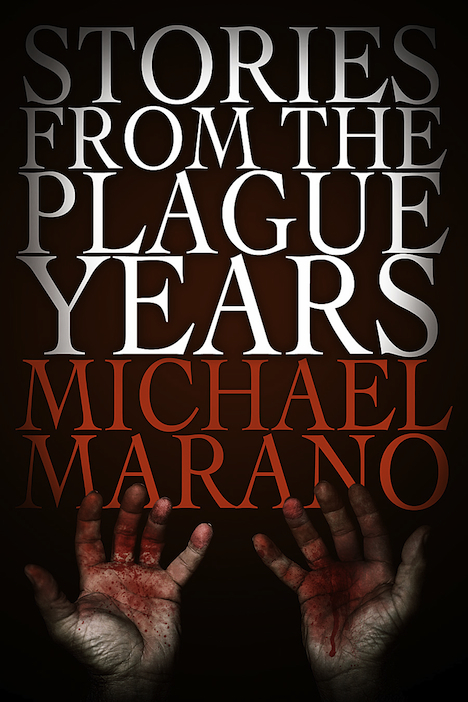 My good friends at ChiZine Publications are putting together a really beautiful signed, limited, and I do mean limited, edition of my recent collection of horror fiction Stories from the Plague Years, coming in December 2012. The bitchin’ new cover is by Erik Mohr. Check it out! 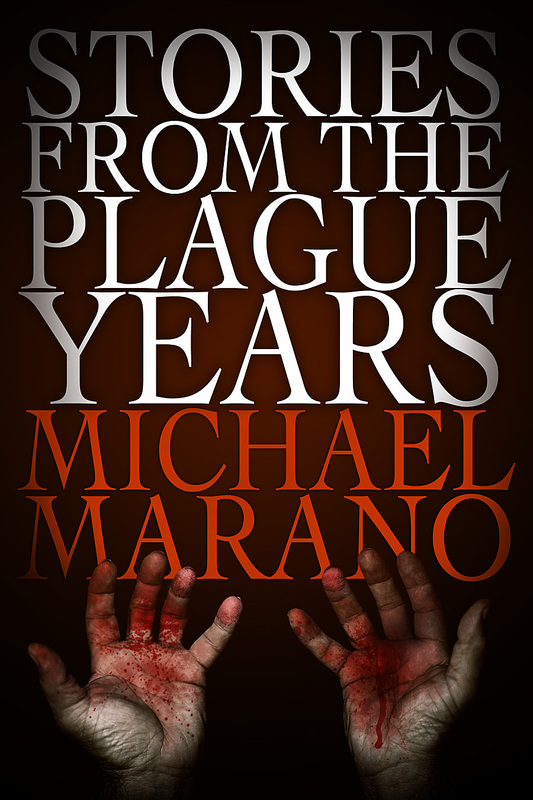 I dig the new cover a lot… we’re making the blood on the hands kinda ambiguous. Blood on a murderer’s hands? Or is it from Scarlet Fever? Or both? 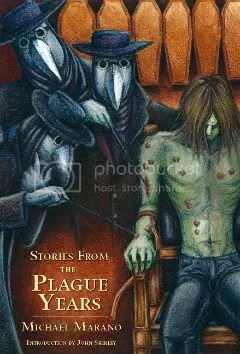 The concept nicely blends the theme of violence as plague that I explore in the book. 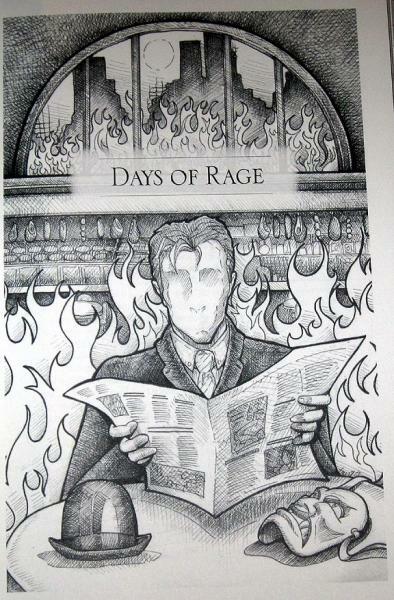 This is a scan of Gabrielle’s illustration for one of the sections of the book, “Days of Rage”, which explores the idea of Violence as Plague that I talk about above. The mask on the table to the lower right is a Shakimi mask from Japanese Noh theater. It’s a traditional representation of… demonic rage. The limited edition Trade Paperback will be signed by both Gabrielle and me. We’re really excited to to be putting this new edition together and making the book available to a wider audience, because the original edition from Cemetery Dance sold out in just nine days. It was kind of frustrating, to get really nice notices on the book–like being named one of the Top Ten Horror Publications of the Year by Booklist, the original novella “Displacement” getting nominated for a Shirley Jackson Award and the original novella “Shibboleth” getting an Honorable Mention from Ellen Datlow— and not have any copies available anywhere to share with anybody. Also, I am pretty psyched that this text of the book will be corrected. These will be the preferred versions of all the stories, both original and reprinted. Now, when I say that this signed limited edition trade paperback will be coming out in December, that doesn’t mean you can just pick it up in December. You need to pre-order a copy from Cemetery Dance or ChiZine by November 1st, 2012! We’re only gonna print as many as we get orders for, so this really is a one-time offer, folks! So, please place your orders soon, and if you know anybody who might be interested, please let them know!